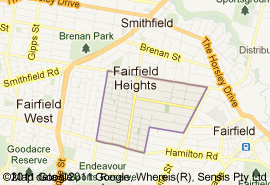 The size of Fairfield Heights is approximately 1 km2. It has 2 parks covering nearly 1% of the total area. There is 1 school and 2 childcare centres located in Fairfield Heights. The population of Fairfield Heights in 2001 was 6,282 people. By 2006 the population was 5,999 showing a population decline of 5% in the area during that time. The predominant age group in Fairfield Heights is 10 - 19 years. Households in Fairfield Heights are primarily couples with children and are likely to be repaying between $1000.00 - $1200.00 per month on mortgage repayments. In general, people in Fairfield Heights work in a non-specific occupation. In 2001, 61% of the homes in Fairfield Heights were owner-occupied compared with 54% in 2006. Currently the median sale price of houses in the area is $467,500.